Turns out the negotiations to revise the North American trade agreement didn't end when it was announced Oct.1. Several significant changes were made to the deal over the last two months. Here are three of them. Turns out the negotiations to revise the North American trade agreement didn't end when the agreement was announced Oct.1. The 60-day period leading up to its formal signature in Buenos Aires on Friday included an additional two months of haggling over specific parts of the deal. Several significant changes were made over the last two months during a process officials call a "legal scrub" — a detailed line-by-line review meant to catch technical errors and typos, to ensure the trade agreement could be implemented the way its negotiators intended. Here are three ways the deal kept changing after its negotiating deadline. Earlier this week, CBC News reported that Canada's national dairy organizations, the Dairy Farmers of Canada and the Dairy Processors Association of Canada, wrote to Prime Minister Justin Trudeau asking him not to sign the new NAFTA. They saw some sleight-of-hand on the Americans' part. They were already facing major concessions in the agreement announced two months ago: new guaranteed market access for American farmers (3.6 per cent of the market, the government says, although the dairy sector says it's more like 3.9), a limit on how much Canada can export to other countries and an end to Canada's special pricing system to keep dairy ingredients competitive (known as class 6 or class 7 in the industry). When the dairy groups combed through the text posted on the United States Trade Representative's website, they also found some onerous new disclosure and reporting requirements. Canadian government negotiators told the groups over several meetings that this was not approved at the table and the language would be removed during the legal scrub. It wasn't — or not completely, anyway. The Canadian dairy industry is now required to publish sensitive pricing information and notify the U.S. before it makes changes to its milk classification system. That likely would include any creative replacement it might be contemplating for its soon-to-be dismantled ingredient pricing strategy. This oversight requirement imposed by Uncle Sam was a challenge to Canadian sovereignty, they argued: domestic dairy pricing isn't the Americans' business, and Canadians should be able to run their industry as they see fit. It's evident from the new text posted Friday that detailed conversations between the governments happened regarding this language. A government official said Friday that some of the text that would have required the disclosure of competitive information was removed from the final deal. But while that portion of the deal was revised, the oversight requirements didn't completely go away. "This should not be understated, and will have a lasting effect on our domestic dairy sector," said Pierre Lampron, president of the Dairy Farmers of Canada, in a Friday media release. "The agriculture chapter fails to address our concerns," Mathieu Frigon, who heads the processors' association, told CBC News, calling the changes "additional concessions" that give the U.S. a say in how his industry works. Monday's announcement of the closure of General Motors plants — in Oshawa, four American locations and elsewhere around the world — focused Canadian minds on the precariousness of Ontario's automotive sector. In recent days, U.S. President Donald Trump and his administration have ratcheted up their rhetorical threats to impose tariffs of up to 25 per cent on imported vehicles and automotive parts. 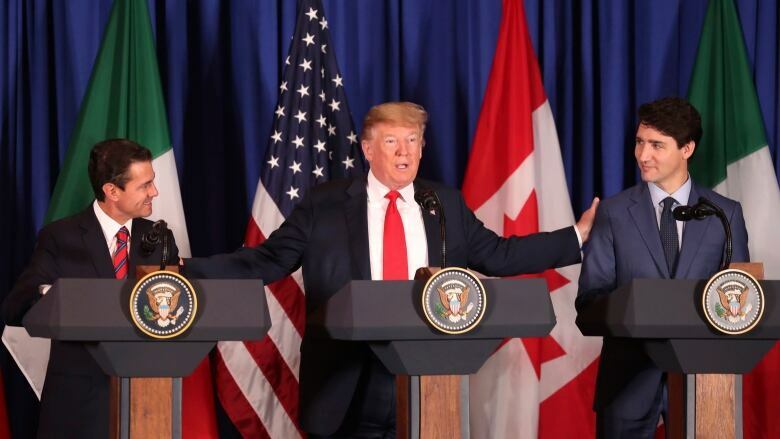 Given that it was not exempt from "national security" tariffs on its steel and aluminum exports, Canada needed what Mexican officials first called "insurance": a negotiated deal to keep Canada out from any future protectionist car tariff announcements. The text posted by the Americans on Oct.1 included a side letter which said Canada had agreed to a quota system: if it didn't export more than the specified threshold, it wouldn't face the tariffs. That letter was revised substantially during the legal scrub. A paragraph describing how the thresholds could be modified by the parties has been removed. And the new side letter — signed by Foreign Affairs Minister Chrystia Freeland after the main ceremony Friday — is about twice as long. Now it's full of new details that appear designed to give Canada control over monitoring and otherwise sorting out which products are eligible for exclusion from hypothetical tariffs. There are now specific commitments in the deal requiring the Canadian government to consult with the Canadian automotive industry as part of this process. And Canada's "insurance" now appears to be more robust than it was in the first draft. That could indicate that what was once thought to be an empty threat on the part of the White House (remember talk of "Carmageddon?") is turning into a plausible source of worry for Canada. Canadian officials like to focus on their "progressive" trade agenda, one they say combines economic objectives with the promotion of human rights and environmental protection. The new labour chapter includes language on eliminating discrimination in the workplace, supporting women's equality and protecting workers from harassment and discrimination on the basis of pregnancy, sexual orientation, gender identity and caregiving responsibilities. That raised concerns among a group of 40 Republican lawmakers, who demanded that this language be removed as a condition of their support for its ratification. That support, by the way, is far from assured in the U.S. Congress, especially since the election last month of a Democratic majority in the House of Representatives. "A trade agreement is no place for the adoption of social policy," they wrote, arguing this deal would force Congress to make changes it has so far explicitly refused to accept. The Canadians vowed to fight to keep this language in the deal. And they did — it's still there. But something new has been added: a footnote saying that existing American policies are "sufficient to fulfil the obligations set forth in this Article" and "no additional action is required" on the part of the U.S. — including changes to the American Civil Rights Act — to be in compliance. This doesn't translate into any meaningful change for Canadians. It may disappoint some Americans, who may have supported including strong anti-discrimination language in the final deal. But there's a bigger take away from this change: the campaign for votes in Congress has already started, and it's going to be a very intense fight. Votes are going to be won and lost on a lot of fronts — even the ones that might seem like mere footnotes to some.